Abstract: Given a complex polynomial $p$ in one variable, $\log|p|$ is a subharmonic function that grows like $(deg p)\log|z|$ as $|z|\to\infty$. Such functions are studied using complex potential theory, based on the Laplace operator in the complex plane. Multivariable polynomials can also be studied using potential theory (more precisely, a non-linear version called pluripotential theory, which is based on the complex Monge-Ampere operator). 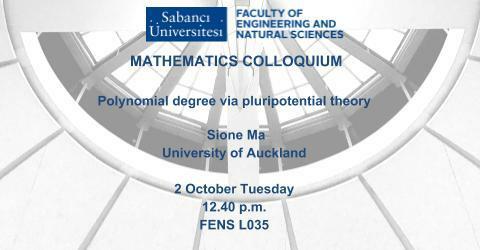 In this talk I will motivate and define a notion of degree of a polynomial on an affine variety using pluripotential theory (Lelong degree). Using this notion, a straightforward calculation yields a version of Bezout's theorem. I will present some examples and describe how to compute Lelong degree explicitly on an algebraic curve. This is joint work with Jesse Hart.